A product may work fine when it is used singularly, that is by one person but what happens when it is used by many people at the same time? Load testing is used to determine how a product behaves when varying levels of loads are applied to the product. Load testing ascertains whether the product can fulfil varying levels of usage. The load testing would be carried out to assess whether the vehicle can efficiently carry five passengers, then six passengers and then finally seven passengers. If the vehicle is developed to carry seven passengers efficiently but during load testing the vehicle uses an excessive amount of fuel, then the vehicle can be construed as failing the load testing with seven passengers. The vehicle manufacturer could then decide to use a more powerful engine and see whether the fuel consumption figures improve. 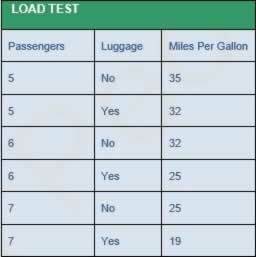 This load test could also include the impact of carrying luggage and how this affects the fuel consumption, (as shown in the load test table below). Additionally, a caravan could be added to the load test, to see whether the MPV can carry seven passengers as well as tow a caravan. By running a series of load tests as shown below, it can be quickly determined through accurate measurements whether the vehicle can deliver what the marketing promises. Load testing is an important indicator in proving whether a product behaves accordingly under normal conditions of use.